The trailer of Jigarthanda was launched today morning at the music launch event and it was also unveiled online a few moments back. The feedback to the trailer has been positive from all corners. The trailer features the stunning visuals of Gavemic U Ary along with the imaginative and eclectic background score of Santhosh Narayanan. The film promises to be a gritty tale laced with violence, romance, action and thrills. The tagline 'A Musical Gangster Story' seems to have summed up the movie well. Simha rocks indeed and we are looking forward to what Karthik Subbaraj has in store in his follow-up to the much loved Pizza in 2012. Exclusive: Four different looks for Dhanush? Arya confirmed, now will it be Suriya or Dhanush? Vikram’s next Idam Maari Irangiyavan with Vijay Milton? 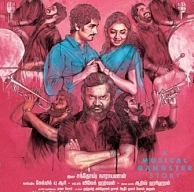 "Lakshmi Menon Is Studying The Same Class For The Past One And Half Years And Karthik Subbaraj Is A Worst Storyteller"
People looking for online information on Bobby Simha, Jigarthanda, Jigarthanda trailer review, Lakshmi menon, Siddharth will find this news story useful.